The Belgian VFX Guy: Has the new Mac Pro 2013 the potential to be a good CGI workstation? 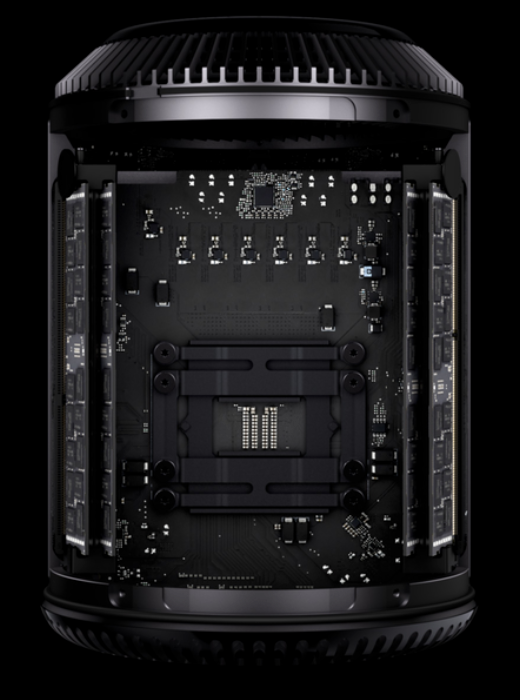 Has the new Mac Pro 2013 the potential to be a good CGI workstation? On the 10th of June Phil Schiller, the senior vice president of worldwide marketing at Apple Inc., presented the new Mac Pro. This new machine looks nothing like the previous model. In fact, the whole thing is redesigned from the bottom up. 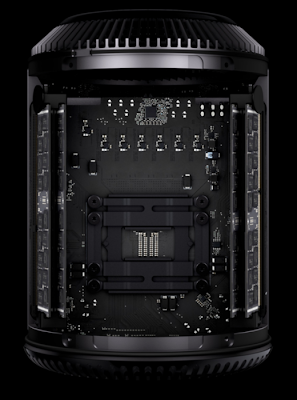 The internals of the new Mac Pro. You can see two memory slots at either side for a total of four. What's under the cylindrical hood? The new cylindrical design has already been mocked by the internet community to be a trash can, jet engine or a Darth Vader inspired machine. I agree that it is a strange design but I can see the benefits when keeping the machine cool. All components are cooled by a central cooling element and one large fan which will keep the noise levels down. It will have up to 12 new Intel Haswell Xeon cores, a dual AMD Fire Pro graphics card, 1866MHz DDR3 memory for a bandwidth of up to 60 GB/s, PCI express flash storage, Thunderbold 2, HDMI 1.4, USB3 and gigabit ethernet. Even the latest wireless technology is incorporated. So, is it any good as a graphics workstation? The new Xeon cores will definitely provide plenty of power for local render jobs. The fast memory and flash drive will run 3D software like Maya quickly. On the pictures, released on the Apple web site, you can see that there are only four memory slots. Compared to the current Mac Pro that seems kind of few. It all depends how much you can fit in one of those slots of course. "So what about the graphics card?" you might ask. The dual professional AMD GPU is not a bad choice but it is not sure if it will be upgradable once the machine leaves the factory. The evolution of graphics cards goes much quicker than the rest of a machine. It usually gets replaced half way the lifetime of the machine itself. There is also the question if nVidia GPUs will become available. A lot of graphics software works with CUDA acceleration. Apple is gambling a bit that software companies will develop more OpenCL applications in the future. That said, Mari, a great painting tool for 3D artists will become available for Mac later this year. One of the things people believe to be the biggest problem is expandability. There are no expansion slots anymore and there is no space for extra hard drives. Apple believes that all expansion should go trough the Thunderbolt 2 interface. It does show potential though. With 6 ports you can add up to 36 devices (6 daisy chained per port) which I am sure is more than enough. And the Thunderbolt 2 I/O is twice as fast as the current one going up to 20 Gb/s. I honestly think that hard drive expansion, although external, will not be such a big issue. There are already plenty of Thunderbolt solutions out there. Besides that, most post production facilities have network attached storage. Yes, four internal drives might be neater and less cable clutter but I don' think performance will suffer too much. A potential bigger problem might be finding solutions that needed a PCIe expansion slot before. Some facilities have invested a lot of money in peripheral hardware which with the new Mac Pro can't be used anymore. There are PCIe expansion racks available but this adds to the cost. And, although I am not 100% sure if this is true, Thunderbolt 2 might not have enough bandwidth for adding an extra GPU in an external rack. Then again, you get 2 professional GPUs fitted when you buy a new Mac Pro which provide already a lot of GPU power. Am I getting one once it is available? So am I getting one when it becomes available? Well, that will all depend on the price. The machine looks great on paper and will definitely outperform my 2008 Mac Pro but if the entry model will cost more than 3000 Euro, it will become hard to justify the purchase. The 2008 Mac Pro was one of the cheapest Mac Pros on the market compared to it's competitors. If Apple can repeat this then I will be one of the first ones to get one. Anyway, I am looking forward for this machine to hit the shelves.